Windows Phone may not be the most popular operating system in the world, but it hasn’t stopped it from trying to bring something new to the table. Some of these features were good enough to be incorporated by Google and Apple into their own devices. Here are some features that Window Phone users got to experience before their Android and iOS toting brethren. Nokia brought with it a number of exclusive applications when it launched its own line of Windows powered devices. One these was Nokia Maps (later rebranded to Here Maps) that allowed users to access maps offline by downloading the maps of entire countries, or just a specific section. The offline maps feature has been present in Lumia devices right from the Lumia 800 and Lumia 710 smartphones. Optical Image Stabilisation has now become a ‘must-have’ for any smartphone claiming to be a flagship device (and even some that are not flagships). It improves the quality of images taken in low-light and reduces blur.Windows Phone users got a taste of the nifty little feature when the Lumia 920 was launched. Call it Glance Screen, Ambient Display or Always On, but in the end, it is a way to offer basic information such as the time and notifications, without the need to turn on the display. Windows Phone was one of the first to offer such a feature with the Nokia Lumia 925 and on other Lumia devices with the Lumia Amber update. Taking a couple of seconds of video before clicking a picture may still be a novelty for some smartphone users. But Windows Phone owners got to check out the feature when it was introduced in the Nokia Lumia 930, and was later available on other PureView branded Lumias with the Cyan update. The Qualcomm Snapdragon 810 is notorious for its heating issues. So, when the time came for Microsoft to use the SoC in their Lumia 950XL smartphone, they decided to pull out all the stops and introduce liquid cooling on a smartphone. A feature that is not found on any other smartphone as of now. Current generation smartphones are pretty powerful devices. Microsoft was the first the exploit the power of smartphones and turn them into mini-PCs via their Continuum feature. Simply connect your device to a dock, which in turn is connected to a display, keyboard and mouse and voilà! You got a PC. 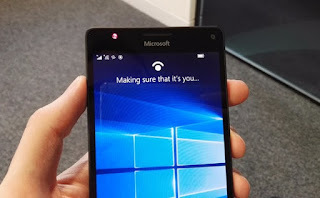 While the Lumia 950 and 950XL weren’t the first to introduce iris recognition technology on a smartphone, they were the first to make it available to the mainstream public, globally, with Windows Hello. In case you are wondering, the Fujitsu Arrows NX-F04G was the first smartphone with an iris scanner. Which of these feature do you love most and think is the best one?